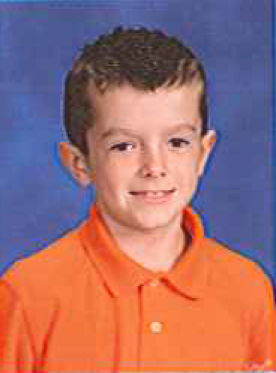 Pittsburgh, PA, November 29, 2012 – When asked what his holiday wish was this season, Clarion-Limestone Elementary School student Bryson Huwar, age 8, said he wanted "to help all kids be happy." Bryson has been selected as a winner of the 9th Annual Edgar Snyder & Associates "My Holiday Wish" Coloring Contest. As a winner of the contest, his holiday artwork appears on the law firm's holiday card. In addition, he was awarded a $100 gift card. "It is a little boy giving another little boy a gift for Christmas," said Bryson, describing his winning submission. To the right of the figures, a table full of gifts is displayed with a sign announcing "toy sale." 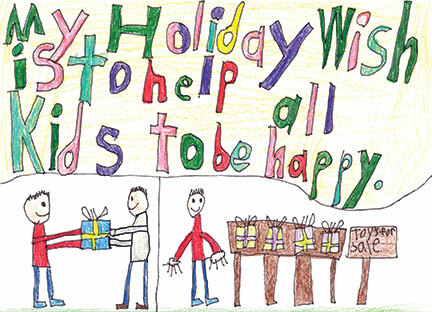 Bryson's wish is articulated in colorful block letters above the illustration, reading, "my holiday wish is to help all kids to be happy." In addition to Bryson, four other students were recognized for their holiday submissions. Réka Götz, 9, of Marshall Elementary School in Wexford was the Grand Prize Winner. Edgar Snyder & Associates donated $1,000 to her school and awarded her with a $250 gift card. The three other runners-up were Maggie Knisely, 10, of Claysburg-Kimmel Elementary School in Claysburg; Emma Kraus, 10, of Paynter Elementary in Baldwin-Whitehall; and Carter Mates, 6, of Rumbaugh Elementary School in Mt. Pleasant. Each runner-up received a $100 gift card and their artwork appears on the Edgar Snyder & Associates holiday greeting card.